But before the needles were picked up, my knitter exercised her mathematical brain and ninja spreadsheet skills and calculated how many stitches I would contain. I admit to a slight flutter of nervousness at this stage. After all if I had come out at less than 50,000 stitches my chance at the needles was shot. But I will contain 68,640 stitches! I'm excited to be eligible to play in the prize division - after all a girl always wants a shot a winning and there are no talent contests / slash best in show here. It's random and I like my odds. My knitter is fond of rainy Sunday mornings. Tea, breakfast and some comfy couch knitting before the rest of the family crawls out of bed. Knitter Bliss. I know the love will be limited today as the marking is piling up around the place and the deadlines are rushing up like a high speed express train on the tracks. (I know my knitter loves me more than that computer and pen and calculator and horrible marking stuff. I'm secure. The marking should realise she only pays it attention cos she is paid to). Today I got to be the reward system for completing a range of tedious tasks for my knitter as she sneaked in a few rows here and there. I had my sleeve increases and 14 rows of the straight stretch of the back of the sleeves done (4914 sts completed). The only issue today is that my knitter doesn't own a 3.75 mm circular needle despite having apparently several thousand needles. So I'm feeling very cramped on the needles at the moment and have to be careful not to slip off. A few on again / off again straight rows today wedged in between marking, housework and work. (Only 1755 stitches). I'm officially about a third finished! I have a back now. Today my knitter powered through 7107 stitches for the day and 21,294 over all. I had my ends sewn in. There were lots as I am being made from recycled yarn from unravelled jumpers from a op shop / charity store / thrift shop. I got hand washed (an enjoyable process with nice warm water and shampoo). Then there was the blocking - a slightly torturous process involving lots of pins. I'm not going anywhere for a while. I need to dry first. Now I get the start of a front. Rib done in a day. 24 rows of monotony. Rib apparently is not thrilling to do. (2256 sts). Knitter is muttering again. No, wait, it's not about me. It's about work and evil marking eating into her knitting time! OK. I'll raise a few complaints in sympathy with her. But it's Friday. Friday night is sacrosanct - it's couch, TV, occasional alcohol, weekly family debrief and knitting time! The weekly unwind sesh. So today progress was two full lace repeats and eight rows of the 5th and last one. (3384 sts). A few more knitter expletives. My knitter is glad she's no novice as there is an error in the pattern for the left front. Early morning saw the last of the lace patterns polished off and the rib sections and decrease done. It was time to increase for the sleeve. The knitter correctly finished the last row of rib on the right side of the work as the pattern directed and went to start the sleeve increases as written with the wrong side of the work facing. Trouble is that is the front band edge not the side edge with the lace where the sleeve should be. The knitter reread the pattern about 6 times, read the pattern for the right front for good measure, checked her count and placing of the rib rows, threw her hands up and added a plain row before beginning the sleeve cast ons. She also checked the pattern page for Rhodium on Ravelry and discovered she was the first person to knit this on Ravelry and that there was errata listed on The Knitter webpage. However, the errata is about bust measurements not sleeve shaping for the fronts. So she made a comment about the error on the pattern page and went back to knitting. I also got to pose for my own photographic session this morning. Having my photo taken always makes me feel like I'm semi-famous or something. Apparently I was deliberately obstructive today. Who, moi??!? 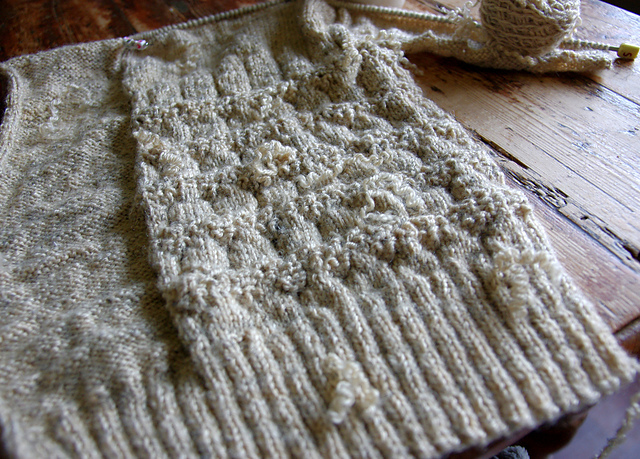 The knitter got to the end of the sleeve shaping and the stitch count was out by two. And it was all my fault. The knitter is a perfectionist. I'm not complaining mind you. I think perfection is an admirable trait when you are on the receiving end of it. But it does involve occasional pain. My sleeve shaping got frogged back to the beginning. 14 rows of stitches disappearing off into the ether - the great stash in the sky. 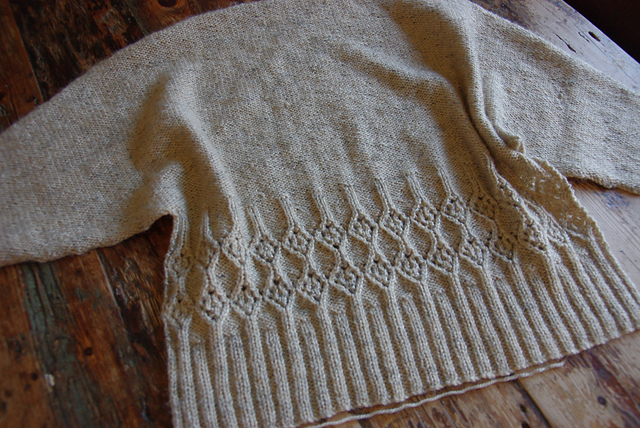 But the shaping was successfully re-knit and well as 11 rows of the straight sleeve section. Powering along and almost at the end of my 9th ball of yarn. But oh, the ends!!!! (4620 sts). Only 18 rows and 2394 sts today. Despite it being a Sunday my knitter went to work for a while today and gave those nasty assignment things more love than me. About 50 assignments uploaded and another 60 or so marked. The knitter is feeling virtuous and her students will be happy to have all their marked work back before the exam. I can't just blame the assignments though. It was hot though. 30 degrees Celsius plus for the second day in a row. My knitter is possibly not the sharpest tool in the shed taking on this challenge heading into an Aussie summer. Apparently knitting wool gets sweaty when it's hot. State the bleeding obvious or what! But we officially are over half way in the stitch count - 55% done. Oh, and there was a quiet session of half an hour or so of end sewing in today too. I feel a little less messy - I think it's the sweater equivalent of having your hair brushed. I just had a good look at my front and I'm coming up a little rough. My straight reverse stockingnette sections have some exceptionally wonky stitches. I'm hoping that blocking tidies me up a lot!! 2929 stitches done today. The last three rows of the straight sleeve section and 22 and a half rows of the sleeve shaping cast offs. The knitter laid down the work having just reached the end of the 8th ball of yarn tonight. The knitter is a happy little Mummy today. Future Doctor daughter is home for SWOTVAC cramming before her last major exams. She hasn't been home for months. And the baby boy got his first year Uni results and he passed everything.... (This was by no means a done deal when he went off to University at the beginning of the year). All is love, peace and happiness in the knitter's household today. I started my morning rolled in a towel shedding a few excess pounds of fluid (water actually) dictating yesterday's sweater dairy to the knitter. (What you thought I was writing this myself? Sweaters can't type! I may have arms but I'm sadly lacking in the finger department. I suspect gloves could write their own diary but not those silly fingerless ones). Then it was stretching time. On the floor, on the mats and all those pins.... I feel like a pin cushion. Not a flattering look. I refuse to take blocking selfies. It's so undignified. And I suspect that fluoro alphabet mats are not the most flattering background for my colouring. The cat decided to help the knitter with her blocking. Random flying sneak skid attacks - or maybe they were attempts at tacklehugs...?, willfully sitting in the middle of the damp unpinned section and stopping to wash its nether regions and patting the wheel of pearl headed pins under the TV cabinet. I feel the knitter showed great restraint in not blocking the cat as well. I swear I'm going to kick the knitter where it hurts for wasted opportunity today. Four whole hours of train trips to the big city for planning meetings and what did she do with all this potential knitting time? She forgot to take another ball of wool with her so wasted nearly three hours of it! Got the rib nearly done (and ran out of yarn and had to twiddle her needles). At home in the evening finished the rib and the lace set up and the first two rows pf the lace panel done. A quite respectable 2068 stitches for the day but it could have been so much more! I participated in a zen knitting evening (couch knitting and bad teenage chick flicks on TV with the middle daughter). 3 and a bit repeats of lace and 4136 stitches (75% complete now). I could feel all the tension and stresses of the week flow out of the knitter. Good vibes all round. I'm going on a road trip. The plan for the day is collecting the baby boy home for the year from his University in Geelong and watching the eldest daughter cheer at the Australian championships in the late afternoon. Cheer comps are great knitting venues. Bit much having to drive for my knitters liking today though (about 6 hours or so) but I will still get some love, fresh air and a change of scenery. However, the knitting was paltry as the cheering was too exciting - only 12 rows done. Today was an exceptionally creative day for the knitter. But all that creativity wasn't focused on me. I am so jealous! It was all about some knitted and crocheted mould of all things. The knitter has been quietly designing patterns for a series of knitted penicillium moulds for a CKAL and today was the day for the instructions to go live. So there was a lot of Photography, primping of the samples and final frantic crochet followed by pattern writing today. I still got slightly over 2000 stitches done on me though in the evening and I'm up to the sleeve shaping on the right front. All the lace bit is done. Today the knitter's brainspace was taken up with dealing with academic marking apprehension - a peculiar affliction common when marking exams. Had her students in fact learned what she thought she taught them? Her mood ebbed and flowed during the day as she came to realize that her first year students were not as disastrous as first feared. They hadn't preformed brilliantly (except for a small group) but most of them had limped to a pass. (They do say Ps get degrees). So I got a cursory row here and there and only 1330 stitches (Almost 85% complete though). 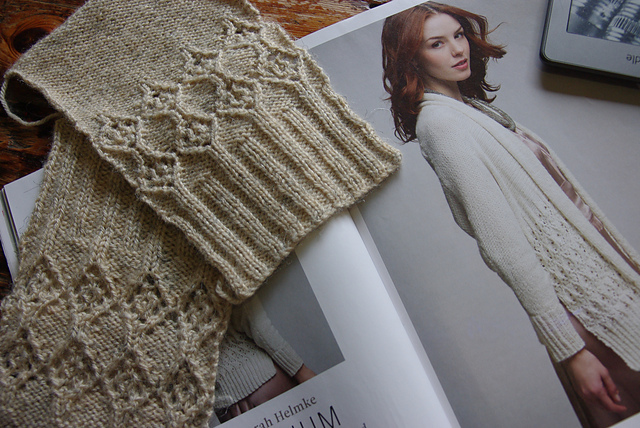 Who can't love the sleeve shaping in this pattern? There are less stitches each row. You can knit and watch the numbers of stitches on your needle get progressively smaller. And it means the piece is almost finished!! When the knitter can home from taekwondo last night after a frustrating and messy class wrangling other people's children, she picked up my needles and you here an audible sigh of relief. The needles flew, the stitch count decreased happily to plan. (The exams waited. The knitter marking in a grumpy mood is a recipe for disaster for someone!) And we're on a deadline. The knitter flies off on a very very very much needed holiday on the 27th and I need to be done by then. (And blocked beautifully and photographed). It's Friday night again. After a hard day of marking exams, the knitter embraced the whole Friday evening combo again, couch, TV and unwind knitting time! (The exam marking today went more smoothly then expected. A student even managed to work a Big Bang Theory reference into an answer about effective science communication and it made the knitter's inner nerd happy for hours. Chocolate and a random serving of gift plum pudding and custard at 11.30am also helped). Productive knitting ensued. Right front finished. The 25 sets of ends sewed in (Yes, there really were 25 sets of ends - that's 50 individual ends for the mathematically challenged among you). I got my warm bath and squeeze and this it was the blocking board torture again. 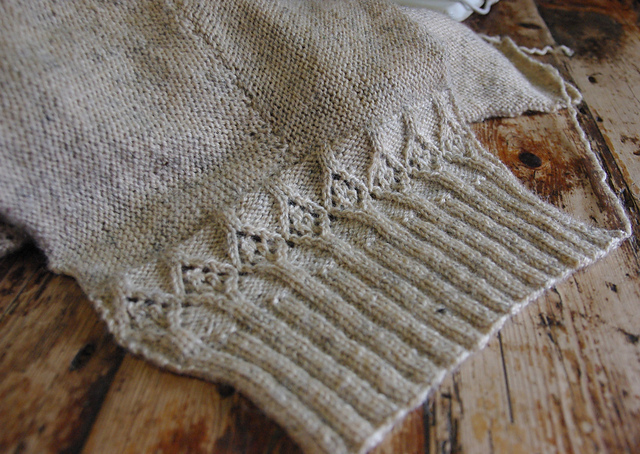 The knitter started joining the left front to the back by sewing up the upper sleeve seam in order to pick up stitches to complete the cuffs. The knitter picked up 66 stitches along the cuff. My sleeves are apparently a little short (rubbish, her arms are incredibly long!) 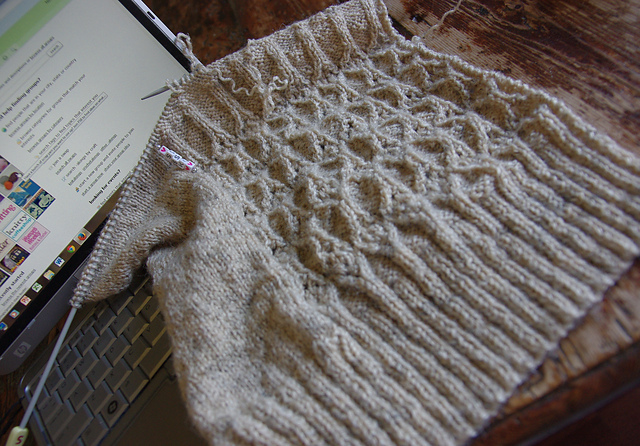 so the knitter is adding a lace repeat at the bottom of the sleeves before she does the rib cuff. About 10 rows into this…. But the knitter is really not happy about one thing. My pattern is designed so that you leave a a small section in the middle of the centre back to sew in the short collar section. But then the stitch counts on the sleeve shaping don’t match up when you are stitching it up. The edges have have to be gently eased against each other as a they are stitched together. This is a design fault in the knitter's eyes. She had sewn the sleeve seam nearly up to the shoulder before she discovered this…. and had to un-stitch way back to the beginning. 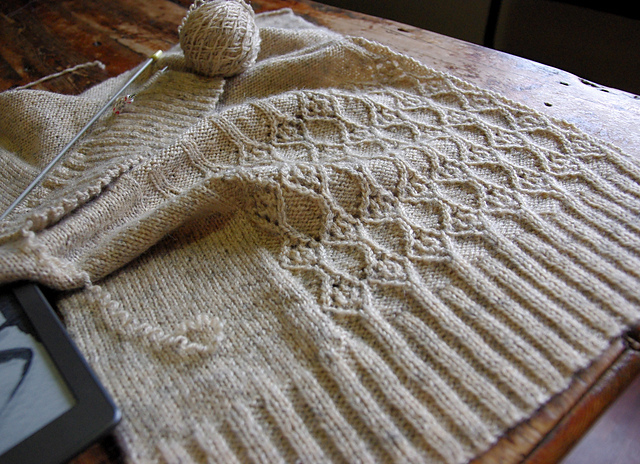 It’s gong to be a pain…..
Today I sat in the corner and mocked the knitter. She could feel her knitting fingers itching to pick me up. But exams and 28 essays which have to be done before 9 am Monday!!! A little knitting sneaked in here and there but not a lot. The end of the lace repeat and some tricky decreases to maintain the pattern into the rib. 15 rows of rib done. 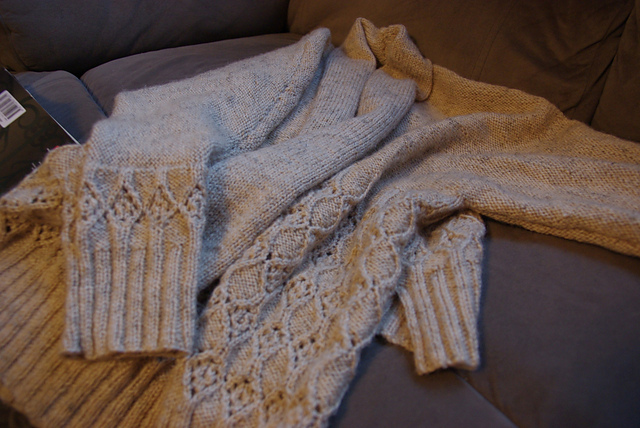 And I am finished (the knitting part at least!). I got a very small cuff baths and an overnight pin out to block as well. 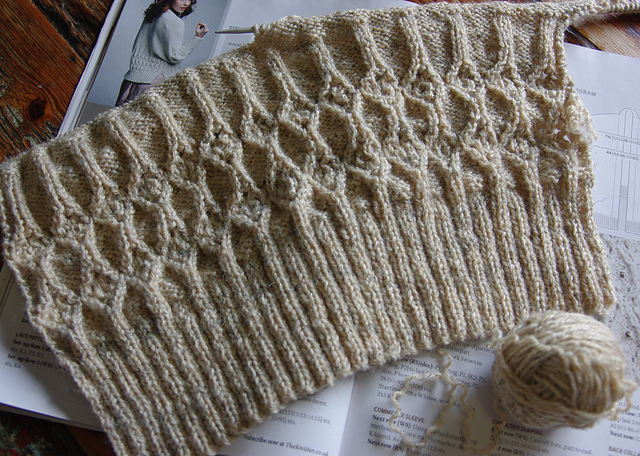 The knitter sneaked in a lace completion in the morning and the rib in the evening. I've seen a lot of the kitchen table and the couch in my short lifetime of being knitted. And it did happen. It was the day from hell. Deadlines galore. Marking of final exams, last day at work, packing for holidays. My final seam got completed at about 10 pm at night after all the rest of the important things. I am a finished sweater (actually cardigan). The knitter tried me on and it was good. I am suitably warm fuzzy and cuddly. I fit in all the right places and skim where I should. The knitters family though were less than complimentary. "It's just weird with that short waist length back and long fronts. What a crazy design". But they do agree I am marvelously well knitted and that my lace is awesome. They can criticize my fashion worthiness all they want. I know my knitter will wear me with pride. Who looks their best when someone is taking photos of them scrumpled on the couch at 6 am in the morning? You want to take a photo of me now? Really, you can't wait until I've brushed my hair and put my makeup on? (Actually sweater equivalent is a styled outfit for the knitwear model, semi professional photographer, the good camera, etc...) However, I can't complain as it was necessary for the knitter to post a finished sweater shot before she nicks off on holidays in the sunshine for a week (and uncertain internet access). I do want to be eligible to win a prize for all my gorgeousness. And we are officially done. And here endeth my diary.